Certainly, whether a company chooses to offer a subscription to a particular title isn’t necessary related to its continuing health. DC doesn’t allow subscriptions to all of their titles, for example. Last time this discussion came up in regards to Archie, it was about Betty, which did end up disappearing many months later. As seen by the company’s sales figures, Jughead is far and away the poorest-selling of the (small) line of comics Archie puts out, so its departure wouldn’t be a surprise. But I was disappointed to hear it, especially after I saw a commenter at the ArchieFans site point out that the character’s solo title has been running since 1949! 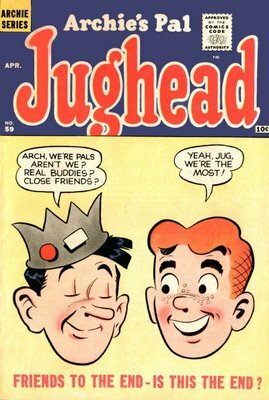 Jughead is also one of the company’s most entertaining titles, focusing on humor in unexpected ways and often moving beyond the love triangle-style stories. Then there’s the hat, which has its own fascinating history as a time capsule artifact. I’ve crunched some numbers. In 2011, there were 6 floppies published for a total of 48 issues in the year. In 2012, Betty, Veronica, and Archie & Friends were axed. Kevin Keller was added. That brought the total number of issues published down to 30 for the year. With Jughead ending, 2013 will likely see a total of 24 issues published. Meanwhile, the 6 digests offer a total of 60 issues per year (the last page says they’re published 10 times per year; the subscription site says 11; I went by 10). It really does seem like the digests take up the majority of the Archieverse at this point, although I’m not sure how much of each digest consists of new stories (then again, you could take the “everything old is new again” approach, which means Cheryl effectively has a regular series again ). That’s just as well, since the digests are far more accessible than the floppies (although the trade-off is smaller artwork). Conversely, all of the headline-making material is in the floppies: Archie, Betty and Veronica, and Kevin Keller. I have the feeling that Archie Comics is using the remaining floppies as laboratories for headline-making material and publicity, knowing they will eventually be reprinted at little cost in the mainstream digests. I agree with this analysis. Most of what Archie is putting out these days is either 1) bait for free publicity, such as the Kevin Keller series bringing an out gay character to the group or the “occupy” Riverdale storyline or 2) reprints, which don’t require paying anyone other than the editor who assembles them. If this is true — and let me reiterate, it may just be jumping to conclusions — then Archie is down to only four periodicals: Archie, Betty and Veronica, Kevin Keller, and the Life With Archie magazine.